I had a trip to the UK this month and only had time to read media coverage of the recent Babson Survey Research Group (BSRG) survey on open educational resources (OER). What a mistake. The Chronicle of Higher Education had a flawed description of a key question - actual and planned adoption of OER material by faculty - that misinformed readers like me who didn't read the actual survey report, at least initially. The open-educational-resources movement, commonly known as OER, is an effort to encourage academics to use open-licensed materials in their classrooms as a way to lower costs. Some nonprofits, like OpenStax, have produced textbooks based on this material. The survey shows that OER has made inroads: 22 percent of people who teach introductory courses, subjects in which free textbooks are most commonly available, use it as required material, up from 15 percent last year. Yet the percentage of faculty members who say they will use, or consider using, open materials in the next three years actually dropped slightly, with the numbers now at 6 percent and 32 percent respectively. On the surface, this description indicates that OER adoption increased for faculty teaching introductory courses, but the second paragraph shows a potential drop in adoption over the next three years for all faculty. That would be major news showing that the OER movement hit an inflection point and is likely to drop soon, even though faculty have a natural affinity for the same issues that OER offers - lower cost and the ability to remix / reuse. Each year, this survey asks faculty members who are not current users of open educational resources whether they expect to be using OER in the next three years. This question is only for non OER-adopting faculty. In other words, it measures growth potential, not total adoption potential. In fact, the percentage of faculty who used required OER material in any of their courses more than doubled this year, and based on the question above should continue to grow. BSRG further described the numbers for non OER-adopting faculty. There have been minimal changes in the proportion of faculty who report that they will use OER in the next three years, dropping slightly from 7% in 2015-16 and 2016-17, to the 6% reported this year. The number who report that they "Will consider" OER grew from 31% in 2015-16 to 37% for 2016-17, before dropping to 32% for 2017-18. This description is poorly worded and misses the context provided earlier, which I assume was part of the problem with Chronicle coverage. As for actual adoption, the category of "all faculty" grew significantly over the past year. Nearly one-quarter of faculty that teach large enrollment introductory courses report that they are using OER in some fashion, with more of these faculty responding that use OER as supplemental rather than as required materials. The rates are lower across all faculty, with 13% reporting using OER as required course material in at least one of their courses. These numbers represent a large increase over those in previous years, with the overall faculty rate of required OER use climbing from 5% two years ago to 6% in 2016-17, and then making a large jump to 13% this year. 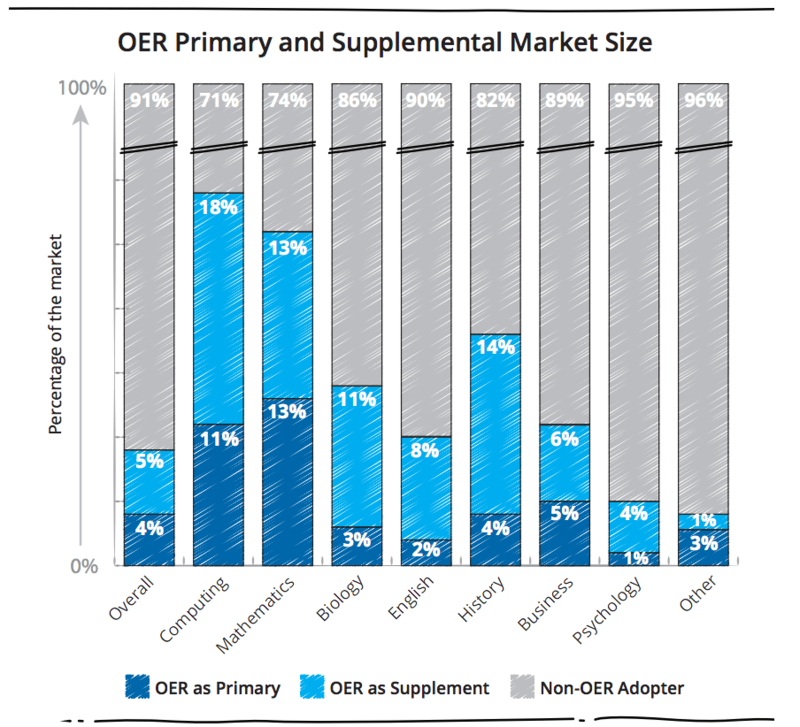 Given the sometimes vague understanding of the OER and its licensing, care must be taken in interpreting these results. Are faculty lumping any free resource into the OER category, even those that are not licensed as OER? Based on previous results we have to assume that there is some level of over-reporting in these figures of OER use; we just don't know how much of an impact this is having. What is interesting is that this adoption growth aligns with an independent source, the Cengage OER survey from Fall 2016. What the data appear to show is significant growth in OER adoption for all faculty as well as for the subset teaching introductory courses. Adoption should continue, although it could be at a slower rate than was seen over the past year. It pays to read source material when the data describes important trends, especially when the results are surprising. I wish I had done this earlier.